Grape vines first arrived in Australia with the first British Navy fleet in 1788. Heat and humidity were a problem for initial plantings at Sydney Cove, although relatively large vineyards were planted near Parramatta in 1805 by Gregory Blaxland and near Camden in 1820 by William Macarthur. The Hunter Valley was the first commercial wine producing region in Australia, with Wyndham Estate being established in 1828. By the 1840’s wine production was being conducted by Italians in Riverina, the Swiss in Victoria, Dalmatians in Western Australia and Lutheran Germans in South Australia, particularly the Barossa and Clare Valleys. Commercial grape production was happening in most states by 1850 and by 1854 the first wine export of 6,291 to the United Kingdom had been formally recorded. The disease, phylloxera, impacted some states in the late 1870’s and a few active pockets remain but many areas in Australia are phylloxera free and have very old, ungrafted vines. Australia is the world's fourth largest exporter of wine with Shiraz, Cabernet Sauvignon and Merlot being the dominant red grapes, and Chardonnay the most widely grown white grape. The country's most famous premium wine is probably Penfolds Grange but wines from Henschke, Torbreck and Tahbilk and many others have also had much international critical acclaim. The 1955 Penfolds Grange vintage was submitted to competitions beginning in 1962 and the 1971 vintage won first prize in Syrah/Shiraz at the Wine Olympics in Paris. 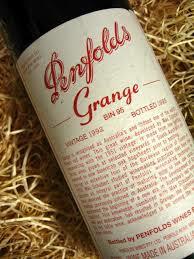 Robert Parker has written that Grange "has replaced Bordeaux's Pétrus as the world's most exotic and concentrated wine". The main wine producing regions of Australia are in the cooler south east of the country but there are about 60 wine producing areas around the country. Vineyards in South Australia (e.g. Barossa Valley, Clare Valley, Coonawarra), Victoria (e.g. Swan Hill, Yarra Valley, Rutherglen) and New South Wales (e.g. Hunter Valley, Mudgee, Riverina) produce most of Australia's wine. But Tasmania, Queensland (e.g. South Burnett, Stanthorpe) and Western Australia (e.g. Margaret River, Swan District) also also growing in importance and stature. It is not unusual to find a vineyard almost anywhere in Australia, even Alice Springs had a winery, in the parched red centre of the country called Chateau Hornsby! Chateau Hornsby is no more (previously the only winery in the state), but founders John and Shirley Crayford established Red Centre Wines on the Stuart Highway, 180km north of Alice Springs with plantings of Shiraz, Ruby Cabernet, Riesling and Chardonnay, but specialised in mango wines. As of July 2015 Crayford was reported as being forced to sell Red Centre Farm due to health reasons. The Heathcote region in Victoria is around half an hour by car from Melbourne. It has deep red, water retaining soils rich in minerals known as Cambrian earths and is famous for its Shiraz but also produces some very good Cabernet Sauvignon. These reds are intense and bold, with good depth of flavour. The region sits on the north side of the Great Dividing Range at elevations between 160m and 320m. Rainfall is evenly distributed between the seasons and the temperature is temperate, with cooling winds from the south. The Grampians region is synonymous with the Grampians National Park and it is home to Great Western, Australia's best-known sparkling wine brand. Geographically is it between the Grampians Range and Serra Range to the west and the Pyrenees Range. The region itself is not high at around 350 metres. Vineyards are planted on slopes receiving plenty of sunshine for their late ripening varieties, with Chardonnay, Riesling, Cabernet Sauvignon and Shiraz being the major grapes . Ondenc (found predominantly in the Gaillac region of southwest France) and Chasselas (widely grown in the cantons of Switzerland where it has several regional synonym names, the main one being Fendant in the Valais canton. It is considered an ideal pairing for raclette or fondue), white varieties particularly suited to the cool climate. The Pyrenees Region is in the west of Victoria with a temperate climate, with the majority of vineyards in the area near Redbank, Avoca and Moonambel. Soils are acidic, sandy loams with quartz grains. Vineyards were planted as early as 1848 and since the 1970's the region has been a significant producer of full-bodied red wines based on Shiraz and Cabernet Sauvignon grape varieties. The Yarra Valley is around a one hour drive from Melbourne and is known for its Chardonnay and Pinot Noir production, though Shiraz, Cabernet Sauvignon, Cabernet Franc and Gewurztraminer, Semillon, Marsanne and Riesling are also produced in this area. Wine production started in 1837 when William, James and Donald Ryrie established a cattle property called Yering Station and planted a vineyard on the site, the first recorded one in Victoria. The valley is surrounded by the Great Dividing Range east, Plenty Ranges west and Dandenongs to the south. Most wineries and vineyards are centred round the towns of Lilydal, Coldstream, Healesville and Yarra Glen. The soils are acidic with grey-brown loam in the South of the region and red volcanic soil in the North and West. The climate is relatively rainy and cool, though during the summer there can be very hot days and even drought conditions. The Hunter Valley in New South Wales is most famous for Semillion but also produces Shiraz, Chardonnay and Cabernet Sauvignon. It is divided into the Upper and Lower Hunter Valley but the majority of the Hunter Valley's most prestigious vineyards are located on the southern valley and foothills of the Brokenback range (part of the Great Dividing Range). The first major planting in the Hunter Valley came in 1825 when James Busby, widely considered the father of Australian wine, purchased vineyard land between the settlements of Branxton and Singleton and named it Kirkton after his Scottish birthplace near Edinburgh. In 1831, Busby traveled extensively throughout Europe and South Africa, collected cuttings from over 500 vineyards, including six cuttings of Syrah from the Hermitage hill in the Rhône. When he returned, many of these cuttings were planted in the Hunter Valley at the Kirkton estate now owned by his brother-in-law William Kelman. The area is one of Australia's hottest and wettest wine regions and with mountains to the west and north the Hunter Valley acts as a funnel, pulling cool ocean breezes into the area. In the summer, the average daily temperature regularly exceeds 21.1 °C (70.0 °F) while during the winter the temperature averages around 4.4 °C (39.9 °F). During the growing season the Hunter Valley receives an average of seven hours of sunshine a day, but with the cloud cover coming in off the ocean the sunlight is slightly diffused which gives the vines some protection from heat stress. The Orange wine region is located on the slopes of Mount Canobolas (an extinct Volcano) between the Cowra and Mudgee areas in the Central Ranges Zone. It is Australia’s highest grape growing region with vines growing up to 1100 metres and is particularly known for its Chardonnay. The Adelaide Hills wine region is on the eastern edge of Adelaide (about a 30 minute drive from the city) within the Mount Lofty ranges. It is a long established wine area with a relatively high number of wineries interspersed with apple and pear orchards and dairy farms. The Adelaide Hills forms a narrow corridor 70 kilometres long and 30 kilometres wide and the elevation varies from around 400 metres at Macclesfield, to 600 metres at Piccadilly and 700 metres at Mt Lofty. The area is bordered to the north by the Barossa and Eden Valleys and with McLaren Vale to the South. Due to its altitude this wine region is much cooler than areas like McLaren Vale and Barossa - on average 4°C cooler during the day and 8°C at night. Annual rainfall can vary between 700 mm and 1250 mm per year. These cool nights, dry summers and autumn ripening conditions produce grapes with a characteristic regional character. Grapes were planted as early as 1839, but it was not until 1979 that the area's interest in vineyards was revived. Since then the Adelaide Hills has built a reputation as one of Australia's most exciting cool climate regions with more than 95 producers and over 4000 hectares of vineyards. Sauvignon Blanc and Chardonnay are particularly well suited to the cool conditions of the region and produce some of Australia's best examples but very good Shiraz, Riesling, Merlot, Semillon and Pinot Noir are being produced on suitably well chosen sites. The wet and cool spring, and dry summers allows the fruit to mature slowly with greater intensity. Within this region are two sub-regions, Lenswood and the Piccadilly Valley. Lenswood has an average temperature in January of just over 25 degrees Centigrade, and 11 degrees in the peak winter months during the day and 2 degrees at night. The best wines from Lenswood are Sauvignon Blanc, Chardonnay and Pinot Noir. Piccadilly Valley is on the elevated eastern slopes of Mount Lofty and often experiences mists and as a result of high humidity and the cold . The growing period is long leading to a later harvest. The area is known for sparkling wines. Coonawarra is on the Limestone Coast of South Australia, that is known for the Cabernet Sauvignon wines produced on its "terra rossa" soil. In fact the Cabernet's have the reputation as being the best in the country and are now internationally recognised for their quality. Coonawara's wine making history dates back to the 1890's and Coonawarra is an Aboriginal word meaning "Honeysuckle rise". It is about 236 miles southeast of Adelaide close to the border with Victoria. The climate is Mediterranean-like with cooling maritime influences off the Southern Ocean which is around 40 miles away. Rainfall is low, 585 mm annually, especially during the growing season (2 cm or so), resulting in the need for irrigation. Coonawarra is most famous for its Cabernet Sauvignon but Shiraz, Chardonnay, Riesling, Pinot Noir, Malbec and Sauvignon Blanc are also planted. The Clare Valley is one of Australia's oldest wine regions, best known for Riesling wines and has around 40 wineries. It is situated in the mid-north of South Australia, 75 miles north of Adelaide. The valley runs north-south. Wines are planted in the valley from 400-500 metres (1300 to 1600 feet) with the the cool to cold nights and hot summer days. The higher altitude, compared to other wine regions in South Australia, ensures cool nights even during the heat of summer allowing the fruit to ripen more evenly and slowly. Rainfall is predominantly in Winter to Spring (June - September) with an annual average of around 630 mm. The most important white variety is Riesling and the main red’s grown are Cabernet Sauvignon and Shiraz but Chardonnay, Semillion, Sauvignon Blanc, Pinot Noir, Tempranillo and Grenache are all produced. The Watervale and Polish River within the area produce some of the best whites in Australia with a characteristic acidity. The Eden Valley is a cool climate area elevated at between 400 and 600 metres in the Barossa Range, part of the Mount Lofty Range and it is notable for its Riesling and Shiraz. The Eden Valley region is actually not a valley but takes its name from the town of Eden Valley. The area has one sub-region, High Eden in the south and to the East is the Barossa Valley. Although the number of wineries is relatively small the influence of the region on Australian wine making is considerable since the grapes are used by premium wine makers in other parts of the country. High Eden is at higher altitude and is hence one of the cooler areas making particularly good Rieslings. Unlike Barrosa Shiraz, the cooler climate means the wines are a little softer and with less sugar and less alcohol. Eden also produces Cabernet Sauvignon, Merlot, Chardonnay, Sauvignon Blanc, Semillon and Pinot Gris. The Barossa Valley is 35 miles northeast of Adelaide in South Australia. The region has become known for its Barossa Shiraz, a full bodied red wine with blackberry, plum, rich chocolate and spice notes. The generally hot climate of the Barossa Valley usually means that the grapes become ripe very easily with high levels of sugars and low levels of acids. American Oak is used extensively in winemaking in the region. Many Shiraz vines in the Barossa Valley are several decades old, with some vineyards planted with old vines that are 100-150 years old. Other grape varieties grown in the Barossa include Grenache, Mourvedre, Cabernet Sauvignon, Riesling, Chardonnay and Semillon. However, the region is best known for Shiraz. The Barossa Valley shows a mixture of micro climates with temperatures varying from very warm on the valley floors to steadily cooler at higher altitudes on the hillsides and further south in the valley. Despite its reputation as a "warm climate region", main of the Barossa Valley's vineyards are not that different from the maritime climate of the Margaret River Valley in Western Australia. Mean average temperatures during the crucial ripening month of January are around 21°C). Rainfall during the growing season averages less than 2cm which means that irrigation is often used. The exception is many of the old vine vineyards on the slightly cooler western side of the valley which can do without irrigation. The area is particularly known for its Cabernet Sauvignon and Shiraz but other varieties include Merlot, Chardonnay and Verdelho (Verdelho is a white wine grape grown throughout Portugal, though most associated with the island of Madeira, and also gives its name to one of the four main types of Madeira wine). McLaren Vale is a wine region around 22 miles south of Adelaide in South Australia. Grapes were first planted in the region in 1838 and some vines more than 100 years old are still producing and today there are more than 90 wineries in McLaren Vale. Different soil types can be found in this region, including terra rossa soils (similar to Coonawarra), light loam over clay, rendzina soils, soldolic, and Bay of Biscay soils. The soil type is generally quite poor with much of it sandy with a clay base which helps concentrate flavours in the region's grapes. Drip irrigation helps deliver precious water where nature is lacking, although about 20% of the regions fruit is retained as "dry-grown" to encourage more intense flavours to develop. McLaren Vale has a Mediterranean climate with four clear seasons. With a dry warm summer, the area has dry weather from December through to March or April. Most vineyards are found on gently undulating land at about 100 m above sea level. In the foothills of the Mt Lofty Ranges to the east, elevation rises to 320 m. In the north around Blewitt Springs elevation is around 200 m. The region rarely experiences frost or drought due to its close proximity to the sea. Its proximity to the Mount Lofty Ranges sees the cool winds fall down from the hills in the late evening and early morning, chilling the grapes to retain crisp acidity and structure. Good winter rainfall (580-700mm) and low relative humidity ensure consistency of ripening and premium quality fruit. McLaren Vale is considered one of the safest wine growing regions in Australia with a notable absence of rot or frost & hail damage. Notable for producing Shiraz, the grape is by far the most important variety for the region, accounting for about 50% of production and the thin soils, low water and hot climate produce a intense yet smooth flavour of raspberries, olives and dark chocolate with deep purple colours. Shiraz is the flagship of the region, said by some to be the best in the world, though of course those who are fans of French Rhône valley wine or even Barossa Valley reds may dispute that. Other major varieties grown in the region include Cabernet Sauvignon, Grenache, Petit Verdot, Tempranillo and Chardonnay . Blewitt Springs - This area is the furthest from the sea and has the highest altitude, sandy soil, most rain and coolest winters. McLaren Vale - The town of McLaren Vale is the traditional home of grape growing and winemaking the soil is rich in calcium and is slightly alkaline where the soil meets the parent rock. Vineyards on the hill tops are world famous for Shiraz, which produce a very concentrated flavour and colour. The low hills catch the afternoon summer sunshine, guaranteeing that the fruit is ripened. Seaview - Heading north from the main street of McLaren Vale leads to a line of steep hills. The soils in this region are highly variable from red earth clay on limestone to sand on marly limestone to grey loam on clay. The common factor is the thin layer of topsoil, which is among the poorest in the region resulting frequently in low yields and low vigour but very concentrated, complex wines. Hill tops in the Seaview sub-region experience warm nights and cool afternoon sea breezes while valleys experience cold air drainage off the range as it flows towards the sea at night. Vines on the hilltops generally ripen early and produce peppery spicy bold wines, while vines in the valleys ripen considerably later producing wines with bold ripe dark plum characters. McLaren Flat - Lies on the flat land to the east of the town of McLaren Vale. The area has more clay above the subsoil than McLaren Vale, however there are some patches of sand similar to that found in Blewitt Springs. McLaren Flat is home to the best white wine Chardonnay in the area. The ‘gully wind’ flows down from the high hills further to the east even on the hottest nights helping to cool the fruit. Willunga - South from McLaren Vale is the historic town of Willunga. This area is known as the Willunga Plains. The soils in this area are Gilgai or grey clay over limestone with pockets of red earth on limestone. The cold air drains across the flats to the sea, resulting in wines that are consistently good with herbaceous characters and Cabernet like tannins in Shiraz. Chardonnay, Viognier and Sauvignon Blanc are also made. Sellicks Foothills - Sellicks is farthest point south of the region directly overlooking the ocean beaches. The foothills extend the length of the base of the Southern Mount Lofty Ranges. The strip of soil here, mostly red loam, has been eroded from the ranges. It is thin soil and conducive to small grape crops. During summer strong gully breezes hit the vines at night and high winds cause the fruit that remains to produce very intense wines. The vineyards further north do not experience the warming effect from the sea and because of this tend to have a later ripening period with many vineyards producing wine similar to Willunga which the area borders. Padthaway is on the Limestone Coast, adjacent to Coonawarra (100 Km to the North) but slightly warmer, an area which produces some good Chardonnay, Cabernet Sauvignon and Shiraz. Its wines are often richer and fleshier than its neighour Coonawarra with minty notes. Most of the vineyards are on flat ground except on the region's eastern boundary where vines grow on the gently undulating wooded slopes of the West Naracoorte Ridge. The Margaret River wine region to the south of Western Australia, receives its temperate climate from the cooling influence of the Indian Ocean. It has the lowest mean annual temperature range, of only 7.6 degrees centigrade, and high rainfall of 1160 millimetres. The low diurnal and seasonal temperature range means an unusually even accumulation of warmth. The land is undulating with maximum elevation at 90m and the soils are gravelly, sandy loams. The region is best known for clean, elegant Cabernet Sauvignon and Chardonnay. Margaret river Cabernet's are probably just behind Coonawarra in terms of quality but if there is a gap it is small. Many of the vineyards are 2-3 miles from the ocean meaning that the climate is ideal for making European style wines which is a wonderful match with the superb cuisine in the area, especially the sea food. As well as Cabernet Sauvignon and Chardonnay, Merlot, Sémillion, Sauvignon Blanc, Chenin Blanc, Shiraz, Semilion are being produced at a high standard. The majority of the 50 or so vineyards and wineries are in Wilyabrup sub-region near the coastline and south of the Margaret River in Wallcliffe sub-region. Other sun-regions are Yallingup in the north, Karridale in the south and Treeton and Carbunup in the north-west. Porongurup is just East of Mount Barker. The climate is Mediterranean with cool to mild winters and warm, sunny summers. While conditions are cooler and more humid higher up in the ranges with occasional snow on the taller peaks for short periods during winter and spring. The soils are ancient, deep karri loams derived from weathered granite. The Porongurups is strongly indicated for all high quality white wine varieties such as Riesling, Traminer, Chardonnay, and red wine varieties such as Pinot Noir, and Pinot Meunier. It is generally regarded as the most important subregion of the Great Southern. Average ripening period sunshine hours at Mount Barker together with the whole season measure of sunshine hours are nearly identical with those of Bordeaux. Situated in the middle of the Great Southern, with strong continental aspects together with marri soils and lateritic gravely and sandy loams provided from the granite rock backdrop the region is suited to Riesling, Shiraz, Cabernet Sauvignon, and Pinot Noir. Albany’s climate is maritime, strongly influenced by the Southern Ocean; the standard description is that it is Mediterranean, with wet, cool winters and warm, dry summers. Diurnal temperature range is minimal, and moderate humidity in summer assists ripening by reducing stress on the vines. Soil types of the region are either lateritic gravelly, sandy loams or sandy loams derived directly from granite and gneissic rocks. Denmark is slightly cooler and wetter than Albany but similar in many ways. Tasmania primarily grows grapes suited to cooler climates - Pinot noir, Chardonnay and Sauvignon blanc, with some smaller plantings of Riesling, Pinot Gris and Cabernet Sauvignon. The majority of Tasmania's vineyards are located near the cities of Launceston in the north and Hobart in the south. Most of the area of Tasmania is well suited for the production of dry, aromatic white wines but the warmer Coal River Valley and Freycinet Peninsula are starting to distinguish themselves with red wines. Tasmania is the only state registered as a single Australian Geographical Indication but the style of the wines varies tremendously with over 1500 hectares growing grapes. Spread northwest from Devonport and including the coastal towns of Stanley and Burnie and Cradle Mountain this is a higher altitude area than others. This gives challenges to wine makers with plenty of snow in winter and annual rainfall of 10.7 cm. The pinot noir and chardonnay grapes seem to have good potential here. This is a big area for sparkling wine as well as pinot gris with high humidity and 8.5 cm of rain annually. Runs from the Bay of Fires in the north to Buckland in the south, this region has a strong pedigree for Pinot Noir, sparkling wines and riesling due to its maritime climate and west to southwest prevailing winds. There is annual rainfall of around 6cm with frost a big obstacle for wine making. The East coat is definitely an area with big opportunities as well as challenges. The Coal River Valley lies northeast of Hobart, between Cambridge and Richmond. This is a cool, dry area with frost a big issue especially in the southern part of the area. The soils are very diverse with plenty of stones from buckshot to ironstone to red loam and shale. The Pinot Noir grape seems to done well in this region with finessed examples on sites which are carefully chosen. There are also good Chardonnay, riesling, pinot gris and sauvignon blanc based wines being produced. This region is northwest of Hobart with the Derwent River moderating the cliamte and so curtailing frost and extremes of temperature and rainfall is around 5.5 cm per year. This means that Pinot Noir, Chardonnay and Riesling all do well in the Valley. This area is southwest of Hobart and is very cool with over 7cm of rainfall each year. There is a big focus on Pinot Noir with Chardonnay the second favoured grape but it is a challenging and mainly undiscovered area. The Barossa Valley had 3/4 of usual rainfall with heat in December and February. But yields were average with the good conditions ripening grapes to the right level. Shiraz and Grenache were on the whole excellent and many wineries are hoping that 2016 will be a top vintage. In the Yarra Valley a dry winter and spring, accompanied by a record hot October, meant a very early harvest with higher than average yields. A hot January was to follow, but the vine canopies remained in perfect health. The Hunter Valley had above average rainfall in December and January (338 mm), which then was followed by almost nothing in the coming months meaning some vineyards lost half to all their production. Margaret River had good winter rain, followed by dry weather until 90mm fell in January, with rainfall continuing at above average levels through February and March causing disease pressure. For those producers that managed to keep mildew under control Chardonnay and Cabernet Sauvignon were rated as superb or very good. An early harvest year with a dry winter and spring in Southern Tasmania along with record high temperatures in October. Yields were up on recent years and quality seems to have been protected by lack of extreme heat during the ripening phase especially for red grapes. The Granite Belt had perfect weather up to vintage except for a short week of rainfall in late January. Yields were moderate to high with excellent quality Sauvignon Blanc and Semillon, Tempranillo, Malbec and Shiraz in the reds. In the Barossa Valley there was plenty of rain during the winter and the region had the driest spring since 2006 but this was followed little rain in early January together with the lowest average maximum temperature for 23 years. February was the opposite, with the highest mean maximum temperature since 2007. Grapes ripened quickly in February which made picking a challenge. Alcohol levels were an issue for some wineries. It was a great year in the Yarra Valley, with near perfect conditions. Good winter and moderate rain during spring accompanied by warm temperatures increased yields. Warm but not excessively hot temperatures continued into summer and meant an early harvest A dry March, with cool overnight temperatures caused good grape acidity and reduced disease, particularly for Chardonnay and Pinot Noir. Following two good vintages in 2013 and 2014, the Hunter Valley had a tough time. A warm and sunny spring was followed by rain and cold in December. January had some very hot days and more rain, with even more rain the next month. Challenging for wineries overall. Margaret River suffered from the effects of birds and bushfire. The region had plenty of rain in Winter and Spring but little or no rain from November until mid-March. Yields were very low due to poor flowering and fruitset. Chardonnay and Cabernet Sauvignon were least impacted if picked at the right time and free of bird damage protected b nets. The North, South and East Coast vineyards had a very good to outstanding vintage. The weather through November provided ideal flowering conditions resulting in good yields with well formed bunches, accompanied by good rainfall. Summer temperatures were slightly warmer than the average, but markedly cooler than the prior two vintages. 2014 proved to be a great year for Australian wine producers with many regions having a perfect growing season, the conditions described by many as some of the best in living memory. But there was a cold and rainy spring in many regions which impacted on flowering and fruit set, reducing yield for some and frost also an issue. Then in mid-February there was heavy rain, followed by very hot temperatures in March accompanied by bush fires. The 2014 vintage is one of flavoursome, fragranced, modest alcoholic wines in the case of reds. The cold wet spring, caused very poor fruit set and low yield with the following period of hot weather followed by heavy rain in mid-February. After this, mild weather resulted in moderate alcohol, fragrant red wines (especially Shiraz and Cabernet Sauvignon). Yields 40% lower than normal were common and they were lower again in vineyards impacted by October's frosts. But the whites have a good aroma and reds showing good depth of flavour and colour. The Hunter Valley had probably the best year since 1965. A hot spring and early summer was followed by a very mild and dry January and February. Shiraz grapes benefited from the conditions strongly with Chardonnay showing cool-climate characters, and high-quality Semillon richer and more full-flavoured than normal. The 2014 vintage in Margaret River was characterised by a metre by heavy rain in winter followed by a dry and very warm summer. Cold and strong southerly winds hits the yield of whites such as Chardonnay and Sauvignon Blanc/Semillon in some vineyards but higher than average acidity levels in the Chardonnay, Semillon and Sauvignon Blanc helped produce fresh, balanced wines. Northern Tasmania did well in 2014 with little frost and wet weather during the early part of the growing season. Cool conditions meant that harvesting took place in March and April, rather than February, as in recent years. The result was excellent quality pinot noir, riesling and chardonnay. Rockford basket press Shiraz 2004, south Australia , Barossa valley £££ *** quintessential handmade wine!